AMC’s “The Walking Dead” ended the first half of Season Five with the shocking, sudden death of beloved character Beth (Emily Kinney). The series returns Sunday and breakout star Norman Reedus says it picks up right where it left off, with an episode that’s equal parts cerebral, heart-wrenching, and even psychedelic. “This episode in particular is like you’re on hallucinogenics,” Reedus, who plays the show’s crossbow-wielding woodsman Daryl, told TheWrap. He said the rag-tag group of zombie survivors will struggle over the next few episodes to deal with the loss of Beth, who was slain at the end of November’s midseason finale. Reedus’ own character Daryl has suffered a tremendous amount of loss on the series, including the death of his brother Merle (Michael Rooker). But Beth’s death hit him especially hard. Reedus also spoke about the evolution of his character over the series and what kind of sendoff the cast gives a killed-off co-star. TheWrap: Tell us what director Greg Nicotero brings to Sunday’s return episode? Norman Reedus: This episode in particular is like you’re on hallucinogenics. He and [showrunner Scott Gimple] are a two-headed monster that cranks out these gut-wrenching, super thought provoking episodes. It’s a big episode and the rest of them are, too. This is our best back eight. A lot is coming. It would take me a week to tell you about it. TheWrap: Nicotero also directed the finale, right? TheWrap: Will the group be united by Beth’s death, or will it divide them? Certain alliances are being formed, others are being broken apart. There are many different struggles internally within the group and a lot of friction right now. 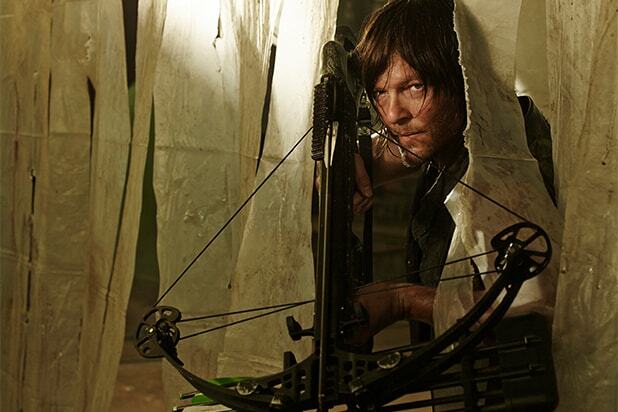 TheWrap: Sum up Daryl’s journey thus far in one word? Maturity. He’s matured in so many ways, even if he’s unaware of it. He’s gone from a hot head to a valued member of the group who cares about people. TheWrap: Is there anything you really want Daryl to do before “TWD” ends or he gets killed? There are a million things I’d like to do with Daryl. I could honestly play this character until I’m 75 years old and still not do them all. TheWrap: We hope he can still hunt at 75. Ha. I’d have a walker for real. TheWrap: Which character’s death hit Daryl the hardest so far? It would be Beth or Merle. As a game changer, Merle. TheWrap: Is there a going away party for cast members who die? Yes. We get together, we have a dinner and we celebrate their work and contributions on the show. TheWrap: Do you ever take the zombie apocalypse home with you? I developed a fighting style on the show – if one walker comes at you, you approach it. If a group approaches you, you have to map it out real quick – I’m going to stab that one in the face, slip around and hit this one, yank the knife back out, go under the arms with this one, stab this one. So, walking around the streets of New York, when a crowd of people are coming at me on the sidewalk, sometimes [I use that]. TheWrap: But you don’t carry a crossbow, right? No. (laughs.) But you know how it is in New York. There is always one guy power walking directly at you. TheWrap: Can you tell us anything about the upcoming ‘Walking Dead’ companion series? I know nothing about it. It has some great people behind it and I wish it the best, but I’m wrapped up in this one. “The Walking Dead” returns Sunday at 9 p.m. on AMC.